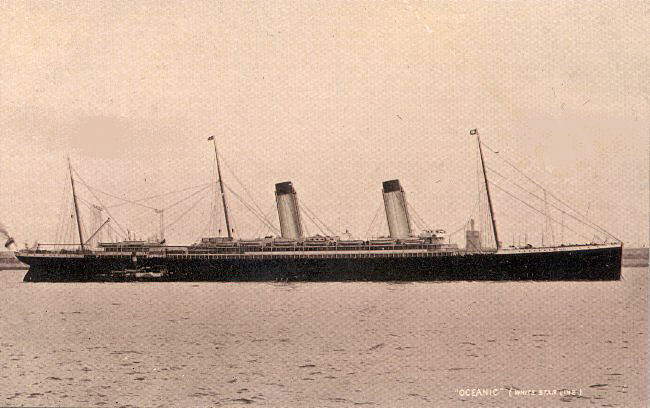 The second ship of the line to be named after the company, Oceanic was launched from the ways of Harland and Wolff on 14 January 1899. Her construction had been partially subsidized by the Admiralty, thus her decks were strengthened to accommodate gun mounts, coal bunkers and bulkheads were placed for maximum protection from gunfire, specific speed and cruising ranges were met, and passenger spaces were easily convertible into spaces for troop transport. Nonetheless, Oceanic's size, sleek appearance, and luxury gave her titles such as "Ship of the Century" and "White Star's Millionaire's Yacht." Her appointments surpassed the standards of luxury for her time. Her first class dining saloon could seat over 400 in one sitting and its ceiling was adorned with a 21 square foot dome. The saloon was lit from a row of oversized portholes on each side of the ship. Where there were no portholes, there were electric lamps. In total, Oceanic had 2,000 electric lamps. Another feature of the ship that was adored by her passengers was the library, which many thought was the most beautiful of her rooms, which was topped with a beautiful glass dome. She could carry 410 in first class, 300 in second, and 1,000 in steerage. 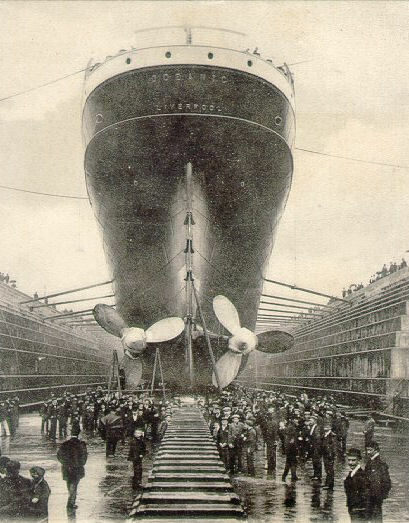 She was delivered to White Star on 26 August 1899 and would remain the largest existing ship in the world, the first to surpass the length (although not gross tonnage) of Great Eastern, until the arrival of Celtic in 1901. 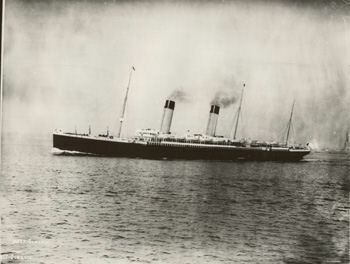 Oceanic's maiden voyage began on 6 September 1899, on the Liverpool to New York run. While Oceanic was a fast ship, averaging 18.96 knots on reduced power on this voyage, she never broke the record to take the Blue Riband. It is possible that she was planned to be a record-breaker, but for some reason, possibly vibration, never did. 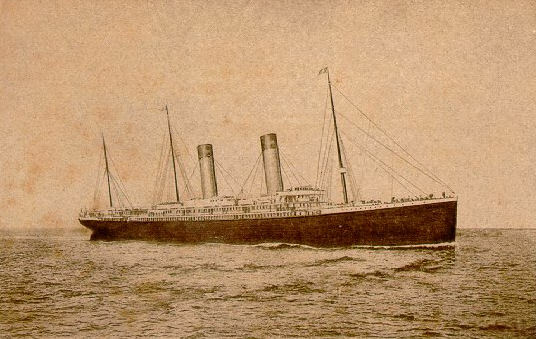 Instead, she was the precursor of White Star's slower, larger, and more luxurious "Big Four," consisting of Celtic, Cedric, Baltic, and Adriatic. On 1 September 1901, because of low visibility due to fog, Oceanic rammed and sank the British coaster Kincora off Tuskar, killing seven. 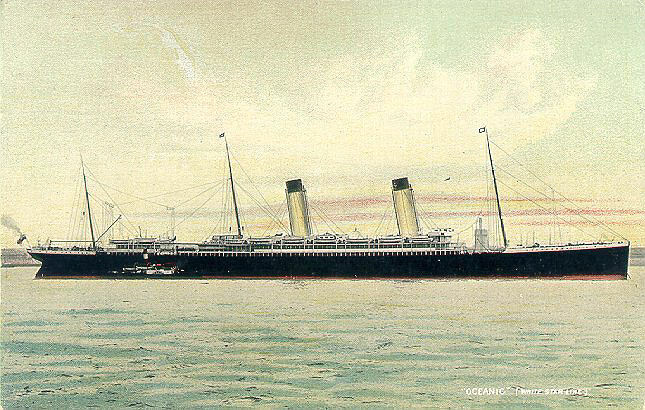 Even with the introduction of the "Big Four," Oceanic remained the ship of the line until the arrival of Olympic in 1911. Her speed and luxury made her very popular with sophisticated travelers, among them International Mercantile Marine (IMM) bankroller, Junius Pierpont Morgan. A mutiny onboard occurred in 1905, resulting in the convictions of 33 stokers. Even with incidents such as these, White Star director J. Bruce Ismay made sure that Oceanic was repaired and back in tip-top shape as soon as possible as she was the last White Star liner launched during his father's lifetime. Originally, Oceanic was to have a sister ship, to be named Olympic or possibly Gigantic, but this sister was never built, and the name Olympic would be reserved for another, much larger and more luxurious ship. 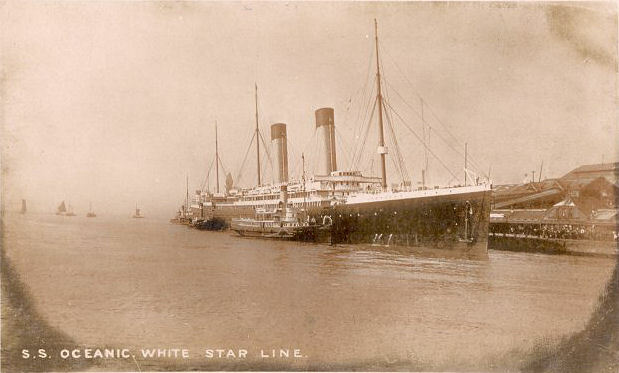 White Star's eastern terminus for the North Atlantic route was moved to Southampton in 1907, and 19 June that year marked Oceanic's first voyage on the Southampton to New York run. In 1911, during a thunderstorm a bolt of lightning struck the ship's foremast. The impact was felt all over the ship. A nine-foot fragment of the mast then crashed down on deck, sending splinters all over the open bridge and narrowly missing the glass dome of the library. Her wireless was also put out of commission for a short time. The Great Coal strike of 1912 resulted in the temporary laying up of several I.M.M. ships, Oceanic in Southampton being one of them, so that the new liner Titanic would have enough coal for her maiden voyage. 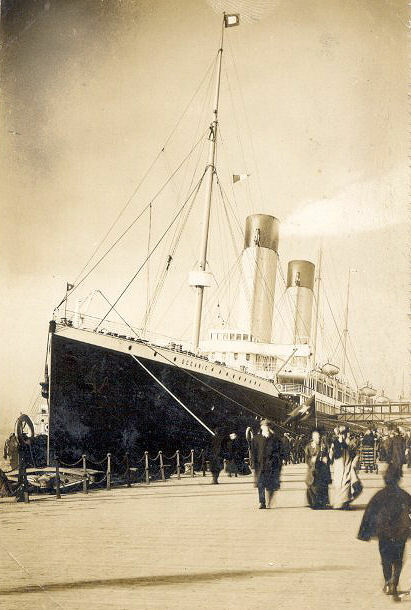 When Titanic left Southampton on 10 April 1912, then the largest liner in the world, the new liner's displacement pulled Oceanic out of her berth so far that a 60-foot gangway linking her to her pier fell into the sea. The ship tied just abeam of Oceanic, New York, was pulled out of her berth, breaking ropes attempting to hold her back, and almost collided with Titanic. Days later, while at sea Oceanic would pick up a lifeboat (collapsible A) from the ill-fated larger liner finding three bodies so badly decomposed that they had to be buried at sea on the spot. 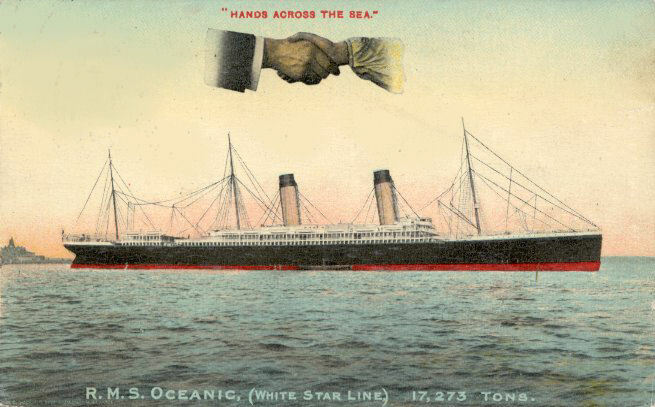 When Great Britain declared war on Germany in August 1914, Oceanic was at sea, going from New York to Southampton. When she reached the Irish coast, she was greeted by two Royal Navy cruisers and escorted for the remainder of the voyage. She was quickly converted to war service and commissioned as H.M.S. 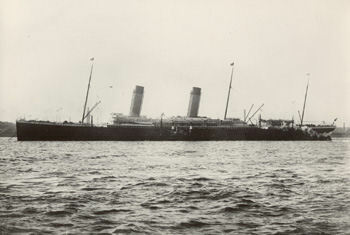 Oceanic upon her arrival at Southampton. The conversion would take two weeks. She would be captained by her master of two years, Henry Smith (unrelated to Titanic's E.J. ), and the Royal Navy's own William Slayter. Smith would be in command in an advisory capacity, but Slayter was in nominal command of the ship and crew. An unsubstantiated rumor stated that Oceanic would be patrolling an exotic (and safe) Far Eastern port, resulting in several of her civilian crew remaining aboard. Merchant seamen who remained were joined with naval officers and ratings, resulting in several misunderstandings between the two groups initially. When Oceanic left Southampton on 25 August 1914, however, her destination would not be Bombay, Rangoon, or Hong Kong, but rather north to Scapa Flow to join the 10th Cruiser Squadron. There must have been some disappointment onboard when this was found out. Arriving at Orkeny, Oceanic was sent to patrol the Western Approaches, west of Fair Isle. She then went to make a courtesy call at Reykjavik, Iceland and returned to Scapa Flow where gunnery practices for her inexperienced crew began. Several of the ship's civilian crew was now composed of several Shetland Island fisherman. Oceanic was to patrol an 150-mile stretch of sea between Scotland and the Denmark's Faroe Islands, making sure that passing ships' cargoes and passengers did not contain contraband or German sympathizers. So that gun crews watch endings would not end at each morning's general alert, Slayter ordered the ship's clock set back forty minutes. Now the ship had two times, Greenwich Mean and ship's, for the ship's two captains and three crews. Needless to say, more confusion resulted. Informally, Smith and Slayter agreed that the former would be in command during the day and the latter at night, even though the two were still at odds over how to manage the ship. Slayter, being of the Royal Navy, was in overall command. Slayter had Oceanic search for German submarines and patrol craft around the island of Foula. She would spend much of her time on zigzag courses to evade German submarines. The duty of recording the course changes would be handled by David Blair, originally second officer of Titanic, but was displaced with the "demotion" of officer Charles Lightoller, who incidentally was now Oceanic's first officer. Foula was sighted on 7 September 1914, and she continued to zigzag despite thick fog. The fog cleared up the next morning. By this time, Blair calculated that Oceanic was well south of Foula. Slayter then ordered Oceanic on a course to take her back to Foula before retiring. Blair made the calculations, and after that was done, he too retired for a nap. Smith arrived to look over the chart while Blair napped and concluded that Oceanic was fourteen miles to the south and west of Foula. Fearing that their course would result in the ship's running aground on the reefs around the island, Smith ordered a course change to the west to the open sea without consulting Slayter. When Blair awoke and reported for duty, he suggested that soundings be taken to determine the exact position of the ship, but Smith vetoed the idea. Half-an-hour later, Foula was sighted dead ahead. Blair, either because the complicated calculations he had to make or because of fatigue, had plotted Oceanic off course. Smith turned the ship several points to starboard to avoid the southern end of the reef known as Da Shaalds (The Shallows) and bring the ship into a narrow channel between reef and island, the latter of which Smith estimated to be four miles off. Hearing the lookout's cry, Slayter rushed to the bridge. Seeing that the ship was closer to Foula than Smith had thought, Slayter ordered a sharp turned to starboard to leave the area as soon as possible. At that moment, with a large amount of grinding, Oceanic was pushed into Da Shaalds, stern first into the reef. The next tide, instead of freeing her, drove her further into the reef. The Aberdeen trawler Glenogil and the Royal Navy's H.M.S. Forward put lines around Oceanic, but Oceanic was pushed in much too far. The tow lines snapped and Oceanic stayed right where she was. Soundings then showed that the double bottom was so badly breached that even if she were to be freed, she'd sink. Orders to abandon ship were given late that afternoon. By evening, all of the ship's 600 crew members were evacuated without incident, ferried to other vessels standing by via lifeboats. She was declared a total loss on 11 September at age fifteen. For the next three weeks, the Admiralty salvage vessel Lyons recovered all guns, all but one of the gun shields, and most of the ammunition among other naval fittings. There was a long period of quiet around Foula afterwards, but then an incredibly fierce storm struck on 29 September. On the morning of 30 September, Oceanic had disappeared. At first, it was thought that the storm had lifted Oceanic off the rocks and carried her to deeper waters to sink, but it was later discovered that the storm had pounded the ship against the rocks so that she was reduced to smithereens. Her remains lay scattered in relatively shallow water. Breaking-up on the spot would be completed in 1924. Smith, Slayter, and Blair were all court-martialed. Comparing Oceanic's log and the ship's last movements as witnessed by the inhabitants of Foula and noting their inconsistencies, Smith and Slayter were exonerated and Blair was let off with a mild reprimand. The hearings resulted in changes in the armed merchant cruisers' administration, and the mercantile officers were given more responsibility.